A boiler is one of the hardest working and longest lasting pieces of equipment in your facility. When properly maintained, boilers can keep things warm for fifteen years and, with older cast iron boilers, that lifespan can be well over thirty. In order to keep your boiler working efficiently for many decades, proper service and cleaning is a must. 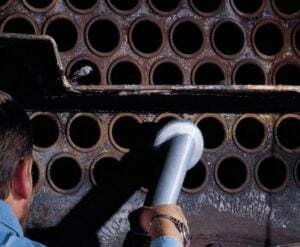 Maintenance of the pumps and burners are critical, but special attention should be paid to the boiler tubes that, if neglected, can lead to expensive and catastrophic failures. The boiler tubes are where the water is heated (water side) and the fuel is burned (fire side). Maintenance staff have to clean both sides of the tubes to keep the boiler working properly. 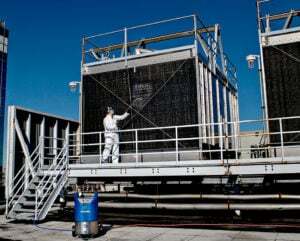 The US Department of Energy (DOE) discusses water side scaling and boiler efficiency loss in its guide to cleaning boiler heat transfer surfaces. In the DOE’s example, a boiler using 450,000 million Btu (MMBtu) of fuel that accumulates 1/32nd of an inch of scale on the water side surfaces has a fuel loss of about 2%. The scale acts as an insulator and prevents the proper transfer of heat from the fuel combustion side to the water side. This 2% fuel loss seems small, but assuming energy is priced at $8.00/MMBtu, that’s an operating cost increase of $72,000 per year from dirty tubes. As more time passes without the scaling removed, the fuel loss becomes greater and the scaling more difficult to clean. Because the scaling does not allow the heat to transfer through the tube walls as efficiently as clean metal, combustion heat is absorbed by the tube on the fire side and raises the pipe wall temperature to damaging levels. 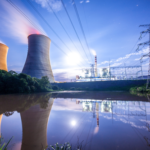 Sciencedirect.com has an interesting case study on the failure of superheater tubes at a power plant. The failure of the tubes and resulting equipment shutdown was related to higher than normal tube temperatures due to scaling on the water side of the boiler. The article has detailed photos of the scaling and tube failure areas that gives a real sense of the damage from neglected cleaning. The lesson in the case study is that the effects of untreated scaling can be expensive not only in repair and operational costs, but in system and operational downtime. But cleaning the water side is only half the job. With high temperature combustion taking place inside the tubes, combustion soot is deposited on the inner surfaces. The coating of soot, called fouling, also has an insulating effect that prevents heat transfer through the tube wall. In IOP Science’s 2015 report “Metallurgical Analysis of Cracks Formed on Coal Fired Boiler Tube”, scientists analyzed the tubes of a large coal fired boiler that ruptured in order to determine the cause of the metal failure. The scientists concluded that “the failure of the boiler tube took place owing to the combined effect of the corrosion caused by the oxide scales as well as the excessive hoop stress.” The report went on to say that “corrosion failure occurs mainly due to the accumulation of ash deposits on the fireside as well as improper maintenance during cleaning procedures of the boiler.” There is a direct link between the cleanliness of the boiler tubes, the performance of the boiler, and the lifespan of the equipment. Boilers that are regularly cleaned transfer heat properly and have significantly less risk of cracking due to a build-up of heat. Unless the boiler is shut down for maintenance, there is no good visual way to determine the level of soot and scale built up on the tubes. Boiler systems equipped with a monitoring system can use trend data to track some system parameters and make a determination if it’s time to perform a cleaning. For example, logging stack temperature over time can reveal rising flue temperatures that indicate a heat transfer problem within the boiler. Heat that cannot be absorbed by dirty tubes stays in the combustion gases and is discharged out of the stack. A boiler monitoring system can send an alarm when stack temperature reaches a high level allowing maintenance staff time to plan a shutdown. Once the boiler is shutdown, a visual inspection can be performed to determine the level of scale and soot on the tubes. Scale and soot are removed with different methods, tools, and chemicals and maintenance staff should have the skills to perform a proper cleaning. Goodway offers a complete line of boiler and chiller cleaning tools and descaling chemicals as well as an extensive line of other maintenance products including coil and drain cleaning products. Contact Goodway to locate a local representative or for help determining the best tools and products for your equipment cleaning. With the correct cleaning equipment, maintenance staff can extend the service of boilers and prevent repairs or replacements before the expected equipment lifecycle ends. 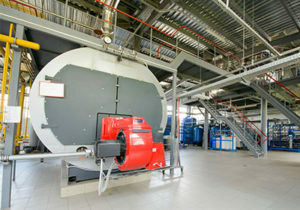 Check out Tips & Tricks articles on cleaning industrial boilers and descaling boilers.